Dale Marshall is a US senator who receives top secret information about his government. Hunted by assassins, he flees to Cuba where he discovers the world he thought he knew was a lie. His life, declared forfeit, and his eyes opened by an unexpected revelation, Marshall finds himself drawn into escalating hostilities that can only lead to one thing – global conflict. 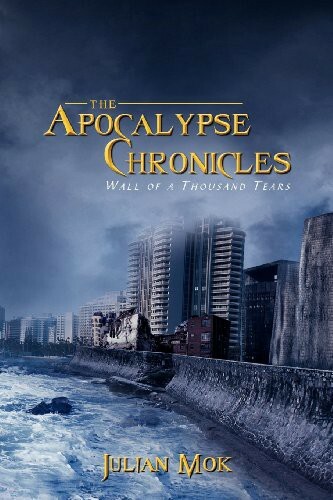 Wall of a Thousand Tears is the first book of a series, The Apocalypse Chronicles, that documents the lead-up to global warfare. This is Earth in the distant future, having suffered from two cataclysmic events: one called the Catalyst, the second called the Burning. This is an amazingly ambitious work, especially considering the author was only 13 years old when he started to write it. The book begins in what is supposed to be the known world: the former US, Cuba and Mexico as one united country after multiple apocalyptic-style natural disasters. It’s not evident what these disasters are in the first part of the novel. The information is conveyed via an info dump or two at a later stage of the book. The world is a pretty interesting one and the author has certainly been imaginative in its creation. However, it wasn’t terribly well painted. For example, I can’t recall now what the events were that jeopardised life on earth. I think there might have been something about a solar flare at one point, but the details are hazy. Additionally, I never felt that I inhabited any specific place throughout the novel. I have to draw the conclusion that immersion in any environment was not a priority of the author. I believe the only real interest of the author was in creating battle scenes – which brings me to the plot. The scale of the story in Wall of a Thousand Tears is immense. However, the plot itself barely existed. This isn’t because there wasn’t a story to be told, but because the author didn’t seem particularly interested in telling it. There is no real progress from one point to the next. The story doesn’t develop, it jumps. To what? Well, to the action scenes. Unfortunately, action scenes by themselves don’t make a plot and, without a strong context, they are usually quite messy. In fact, it’s extremely difficult to write an action scene well, and there must have been 30 or 40 very large and messy action scenes in this book. Anyone familiar with big action computer games is probably aware that there is a token plot, delivered in periodic cut scenes, strung between game play sequences. These sequences often involve a character moving forward a small distance before being beset by foes. Once the enemies are vanquished, the character progresses to the next battle. The story is there in the cut scenes and occasional moments of clarity during the game play, but the details are seldom obvious and the majority of the game is spent in button-mashing chaos. This is one way I could describe the plot of this novel. The second is a reference to a simpler time, when two kids would lock themselves in a room to play with plastic soldiers. Imagine that along with the soldiers, the kids have He-Man and Skeletor, a number of Transformers, Star Wars characters, plastic demons, X-Men and dinosaurs along with some creatures that go bump in the night. Now imagine the kids inventing a totally outrageous story involving non-stop ‘battle royales’. Soldiers are trampled by dinosaurs, which are pulled apart by Transformers, which are cut into metal chunks by the awesome power sword of He-Man, whose brain is melted by the mind-bending dark arts of a demon, who is disintegrated by the sacred rosary beads of the Pope, who is a holy warrior of such incredible capability that several paragraphs of hyperbole are required to adequately describe his attributes. Unfortunately, any attention to a coherent plot is brought undone by a barrage of inconsistencies. A senator rolls out of bed as his door is broken down by assassins but manages to get away wearing the $900 suit that he obviously wore to bed. He marches into the airport with nothing but his suit and a gun which is apparently check-in luggage. He flies to Cuba to a conference where people are waiting to lift the lid on a conspiracy perpetrated by his government. However, the trip itself was an event presumably planned by the same government. He is taken to a UN-style organisation that places him as a combatant into a number of highly dangerous battles, even once being criticised for cowardice, before an attempt is made to retrieve the precious information he managed to intercept. Later, we find out there is a need for him to return home to collect the remainder of this vital intelligence after involvement in several other dangerous missions. Despite there being quite a bit of focus on senator Dale Marshall, he really doesn’t feel like the protagonist of the story. It’s hard to stand out in a crowd and this book is certainly crowded. I was introduced to hundreds of characters in the course of the book with new names still being thrown at me in the last 10% of the story. Admittedly, some of the characters only last a couple of pages, but the noise actually prevents any characters from establishing themselves. Characters were referred to by first name, or last name, or sometimes by either – but at different times, which maximised the confusion. In the end, although I encountered Senator Marshall frequently, I knew very little about him. The writing is somewhat as expected for a high school student; it is overwritten. It was probably the slowest I’ve read a book in the last two or three years. At around 370 pages, it felt like well over 1000 pages. There were too many adjectives and adverbs, not enough clarity and an abundance of misused words and expressions. There was no sense of how time actually passed throughout the story. At times I thought perhaps we had jumped several months, but it wasn’t terribly clear and the frequent shift to different locations, often without any visual cues, became tiring. It was a tough slog, but at the same time, I think it could have been a lot worse and the author should be commended for the effort, which I think brings us to my conclusion. I informed the author in advance that if I were to write a review of this book, then it had to be an honest opinion of the work. As such, I thought the novel was far too ambitious in scope and it lacked anything with which the reader could make a connection. It needed to be drastically simplified. I watched a presentation from the author where he hinted at the amount of research that went into the story, but in my opinion, the research did not actualise into any conveyed message. If there was supposed to be an undercurrent, it was obscured by the chaos and it didn’t help that the novel ended without any resolution. However, in a way, this is all far less interesting than what makes this book a triumph – that it exists at all. I don’t know how many people slave away for two or so years between the ages of 13 and 16 on an epic novel. Perhaps there are figures out there somewhere, but I’m assuming that the number is quite low. The achievement itself puts this author ahead of the curve in my opinion. The imagination is there and the drive and enthusiasm is obvious. The craft of writing can be learned and improved upon over time. Drive? Not so much. Although I would not agree that this book is a success in its own right, once it’s contextualised appropriately it becomes a promise that Julian Mok is making – that he is going to be a writer. And I hope that my critiques and my rating are less important to him than the fact that I believe him. This entry was posted in 2.5, Novel, Reviews, Science Fiction and tagged Action, Dystopian, Post-apocalyptic, Science Fiction, Series. Bookmark the permalink. The plot/premise sounds very interesting. I always find it amazing to discover if an author concentrates most on characters, plot, action or details/world building. It’s only the best that can weave all of those things seamlessly. You did a great job of analysis of all the parts–that’s actually kind of rare for a reviewer too. Most of the time reviewers give you the vague “well, I liked it, but…there was just something…” And maybe an example or two of what didn’t work or what did work. This was very thorough. The author sounds like he has the talent. Now if he analyzes as well as you do, he can probably really put together a great story!